I used to do a lot of freelance work outside of my normal job. I don’t do nearly as much as I’ve done in the past but whenever a job comes up, I like to try to take it. It’s something I really like doing (but can’t make a career out of) and it’s a welcome change of pace. Friday was one of the only days the rest of the year something will come up. I was working at Western Michigan and got a lunch break around 1:00. This is the same time J usually takes a nap with B so I decided to just go to lunch by myself and not chance waking them up by going home. I was close enough to campus that I had plenty of options, but I got a weird craving. I just wanted a cheap hamburger and fries. Nothing fancy but something still delicious. I remembered a cheeseburger I had last year downtown. It wasn’t fancy. It was a simple burger grilled on a flattop and served on a pretty standard bun. It was from Coney Island…..a hot dog place….but it made an impression on me. Coney Island has a second location in Westwood. It’s in the Westwood Plaza right next to Penn Station near the corner of West Main and Drake. While the downtown shop has the feel of a bar with hardwood floors in an older building, the Westwood location feels like it’s in a shopping center in the suburbs. There’s nothing wrong with that. It just doesn’t have the same atmosphere as the downtown Coney Island. The kitchen is right inside the door separated from the rest of the restaurant by the hot dog roller and a sheet of glass that goes up to about eye level. 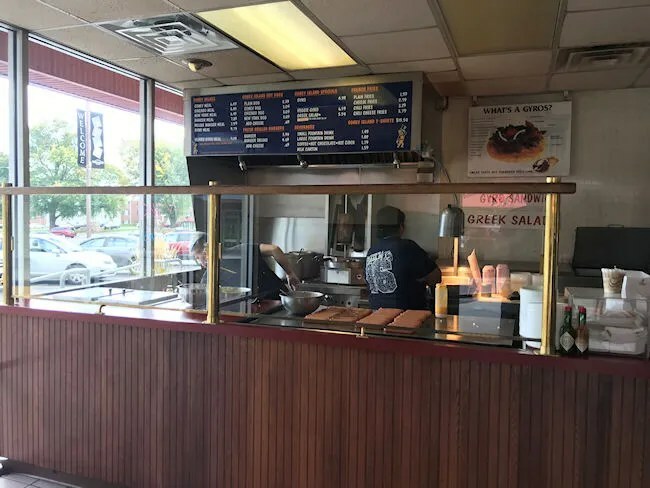 The small menu hangs above the grill and gyro rotisserie. Ordering is done at a cash register next to the hot dog roller. I don’t typically like hot dogs but Coney Dogs do something for me. I’m not going to go all Joey Chestnut on them, but one every now and then is delicious. I still wanted the burger so I ordered a cheeseburger, a coney dog, and an order of fries. The meal cost about $11 which I paid for with my card then waited by a lunch counter for my tray to be handed to me. The dining room was fairly full when I sat down. It’s a small area with a mixture of booths and tables. The red leather padding on the seats constrasts with the worn green carpet on the floor. 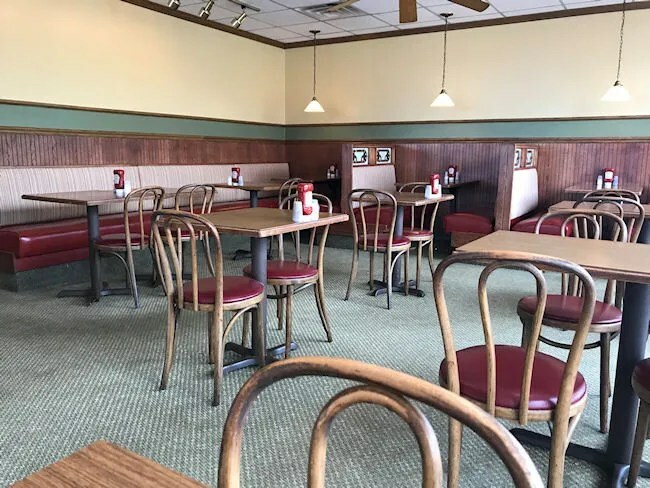 The furniture is all light colored wood which reflects the light coming in off the large windows of the dining room giving the place the feel of a comfy family restaurant. I started with the Coney Dog first when I sat down. 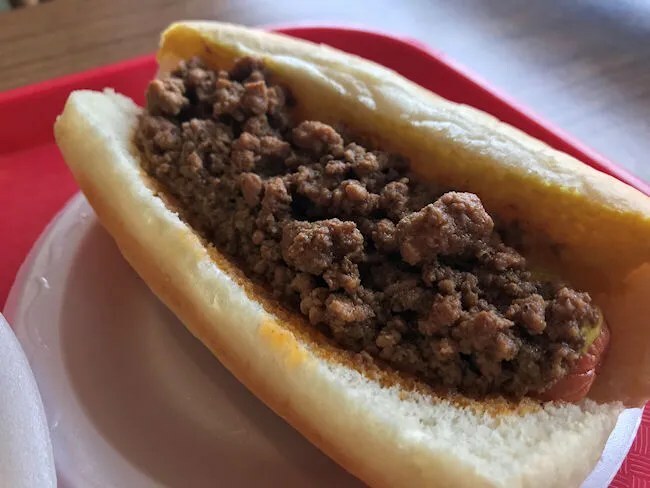 I’m no Coney expert and I don’t really understand the different types of Coney’s, but apparently Kalamazoo has it’s own unique style. 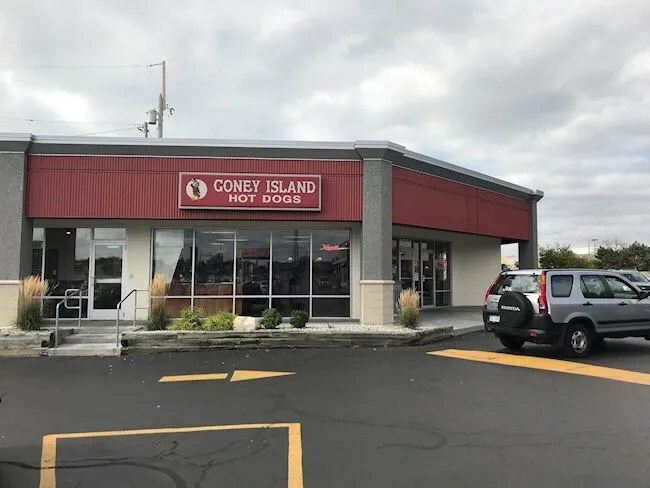 The dog is a skinless Koegel’s frankfurter topped with a chunky Flint-style Coney sauce. Mustard and onions are also traditional toppings. I kept the mustard but skipped the raw onions. I’m always surprised at just how much I like Coney Dogs when I can’t eat a hot dog on it’s own. The dog has such a good snap but the flavor is dominated by the chili in the sauce. The mustard gives the dog a little bit of a vinegar-y taste to go with the chili. The reason I stopped in to Coney Island was the hamburger. 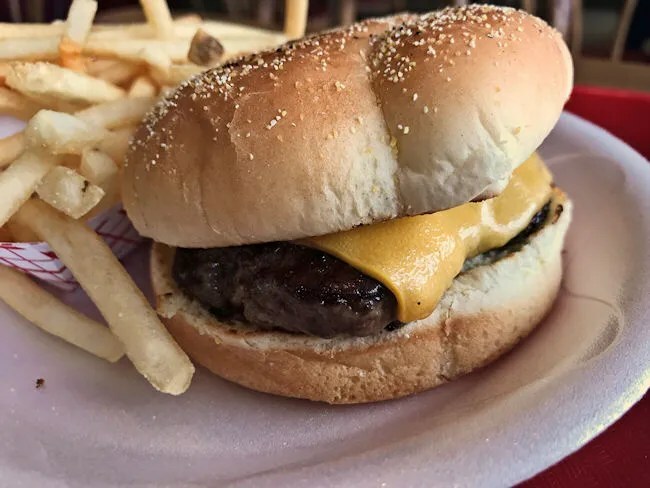 There really is nothing special about this burger and that’s why I like it. It’s a frozen beef patty with a slice of cheese served on a seeded bun. In reality, you could make this at home, but there’s nothing like a charred burger from a well seasoned flat top grill. I don’t do condiments so the burger was a little dry, but I expected that. There are a few options for fry toppings and I should have picked one of them. 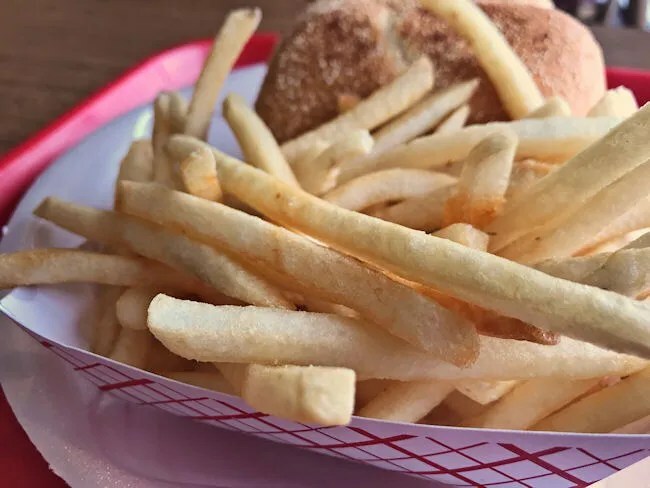 The fries are simple. They’re out-of-the-bag restaurant fries. The options are cheese fries, chili fries, or chili cheese fries. The chili sauce is so good that I really should have done that. The fries were fine with a little salt, but I won’t pass on the chili next. Coney Island is a great little diner. 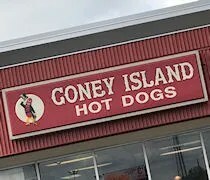 The Coney Dogs are obviously the star of the show, but I always think of the place when I want a burger. I guess it says something though when you can get someone who doesn’t like hot dogs to happily eat a hot dog.